Sure, you know exercise is important not only for physical and mental health, but also for longevity. But there are times that life, career and family obligations take priority, which makes fitting in exercise a real challenge. But getting your daily dose of fitness doesn't have to take a backseat to other, more pressing demands. If you're like most people, you go to the grocery store at least once a week. 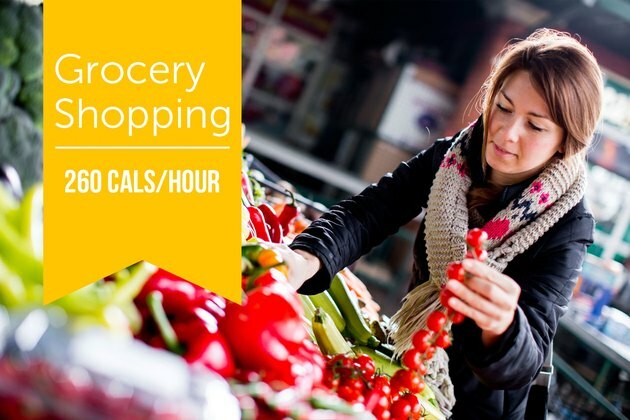 If you can consolidate your shopping into less frequent trips, spending at least an hour shopping, you'll burn about 260 calories. To amp it up, start with the heaviest items first, making your stroll more intense as you push a cart full of cans and beverages through the store. But if you plan on purchasing heavy items, go into a deep squat when lifting them off the floor. When rotating and lifting, breathe and engage your core, making sure your hip flexors are strong, not overextended. 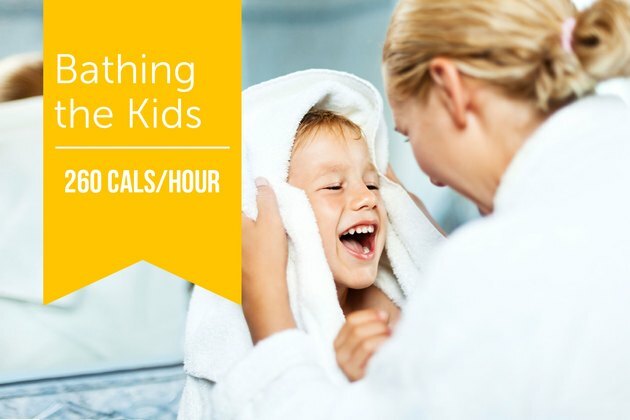 Assuming your children's routines follow the ordinary, you can burn 260 calories for every hour spent feeding or bathing your kids. Be sure to engage your core to strengthen your midsection and maintain good, solid posture. When you can't stand any longer, use a high-seated chair but avoid leaning forward. Activate your core to sit up tall and tuck the tailbone, leaving only a slight sway in the small of the back. The same principles apply during bath time. As you kneel over the tub, rest your knees on a towel or bath mat for protection and comfort. 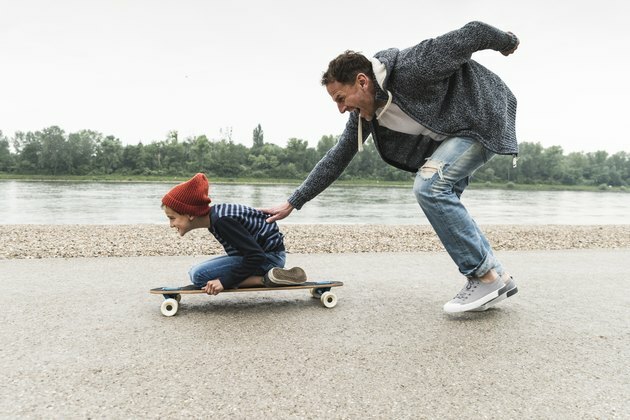 Have fun with your little rug rats and enjoy the opportunity to burn some extra calories! Playing with your children (or younger siblings, nieces and nephews) can be both enjoyable and gratifying. But wait, there's a bonus: You can burn almost 300 calories an hour! The next time you're around young family members, join a game of hide-and-seek or build a fort in the living room. 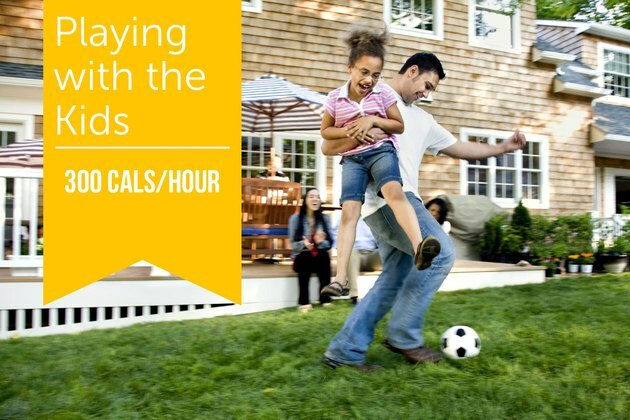 Burn even more calories by taking your play outside for a round of tag or duck, duck, goose. Hop in the pool for added resistance (a game of Marco Polo will burn about 400 calories in 30 minutes). As you play, contract your abdominal muscles to support your back, hips and shoulders. Watch out for the children's safety and have fun! 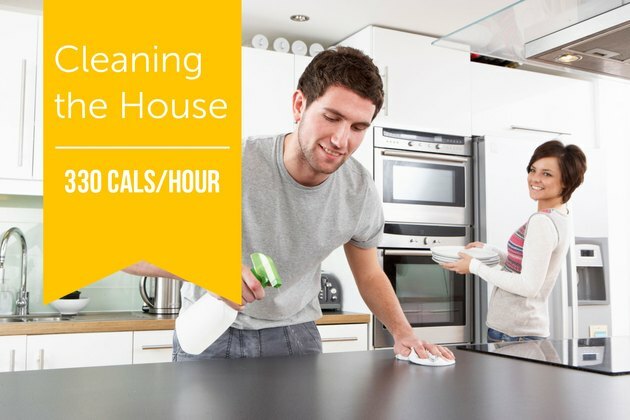 Break out the mop and burn a minimum of 330 calories per hour. With a little innovation and determination, you can amp this activity up. For the first few minutes, move at an easy pace, and then launch into rapid-fire mopping action. Draw precise, vertical lines and move deliberately across the room. Do six or eight of these 30-second bursts, taking 90-second active breaks at your easy pace. When you're in your high-intensity mode, keep your chest lifted, shoulders back and down. Engage your core, especially as you rotate. While many people know walking is good for longevity, it may be surprising to learn that even slow walking (about 3.5 mph, or a 17-minute mile) will burn nearly 300 calories per hour. 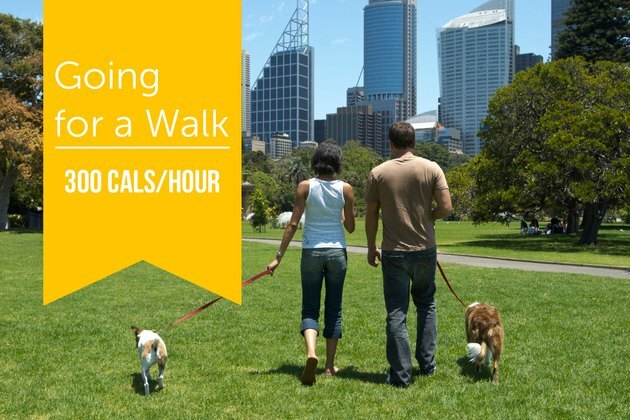 Thankfully, finding various opportunities to include walking in your everyday routine is fairly easy. Park your car a little further away from your destination, walk to your errands around town or stroll through the neighborhood after dinner. For added calorie burn, increase your speed a few notches (i.e. brisk walking) and you can burn about 480 calories in an hour. Remember to take long, steady breaths. Work up to inhaling and exhaling for four steps each. Use your core, walk heel to toe and to wear good walking shoes. Most importantly, relax and enjoy yourself! Some of the most arduous chores can put quite a dent in your daily caloric burn, when done correctly. 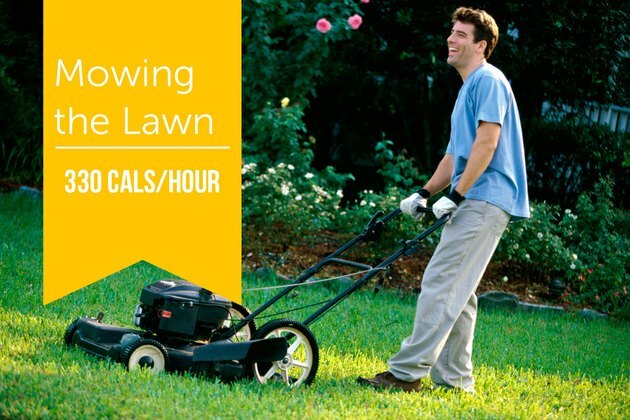 Mowing the lawn with a standard push mower will burn about 334 calories per hour. (Sorry, you can't do this on a riding mower, but you can use a gas or electric mower when pushing, of course.) If you opt for the push-power mower, you can burn up to 410 calories per hour. If you don't have a lawn that requires an hour of mowing, volunteer to mow a neighbor's lawn or spend time raking, hedging, and cleaning up. Be sure to wear good walking shoes, sunscreen and a hat. As you push the mower, allow your core to do most of the work and elicit help from your quads as needed. 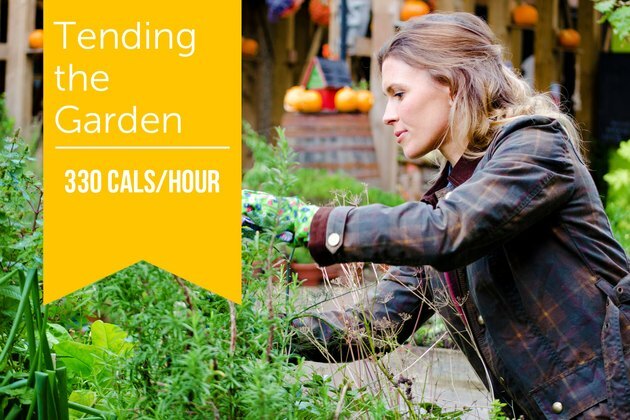 Basic gardening chores like weeding, pruning and watering can burn at least 334 calories per hour! To increase the calorie burn, include some more difficult tasks, such as hauling clippings and transplanting large plants. To avoid injury, try some inner-thigh and torso stretches before you begin. Remember to wear protective clothing and sunscreen, especially if you are exposed to direct sunlight. You may want to bring a folded towel or kneepads to protect your knees when kneeling on a hard surface, like concrete or dry, solid ground. Be mindful of the muscles you're using frequently and intentionally recruit other muscles for support. 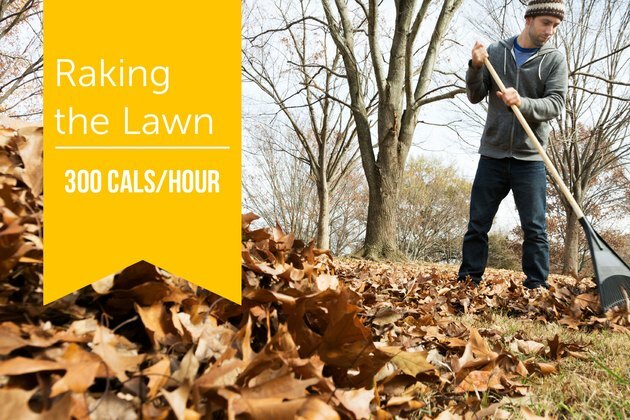 Not thrilled about gathering the leaves from the lawn? Consider this: An hour of this necessary chore will burn about 300 calories. But if you want to get more from your outdoor chores and burn more calories, hold a slight bend in the knees as you rake. Rotate your waist from that position to complete each raking repetition. It may not be pretty to watch, but when you're done, both you and your lawn will be in great shape. Who isn't a fan of automated car washes? 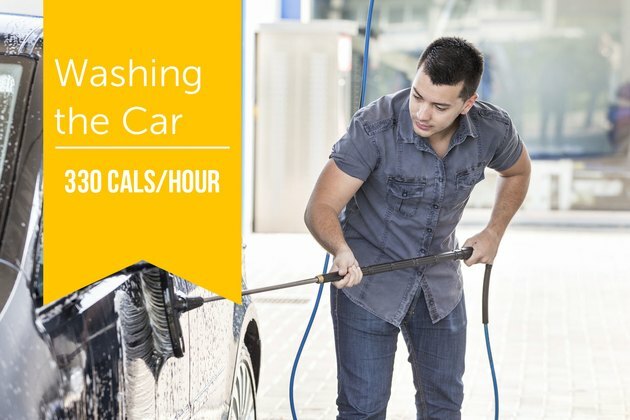 But by simply rinsing, washing and drying your own car, you can burn 334 calories in an hour! That's just the amount for a basic wash and dry. This number doesn't include vacuuming, polishing or detailing those rims and tires. So, the next time there's a long line at the carwash, do it yourself with a hose and a bucket of soapy water. If you want to charge things up, add an interior and exterior detail. You'll walk away sufficiently sweaty with a car that looks far better than any automated wash can produce. The calorie-burning potential in this task is varied, as there are many types of house-painting necessities (baseboards, cutting in, hard-to-reach ceilings and corners). But regardless of the job, an hour of painting the house will burn roughly 350 calories. If you're using a roller, engage your quads by driving through your heels to increase the burn. Recruit your lats, shoulders and biceps to rapidly roll over large areas. Move as quickly as possible over a large surface and don't forget to apply a second (or even a third) coat. Be cautious of muscular or skeletal strain and avoid reaching or extending beyond your ability. A strong core and flexible legs and shoulders will help alleviate some of the risk, but be sure to stretch beforehand. Not many people enjoy moving. 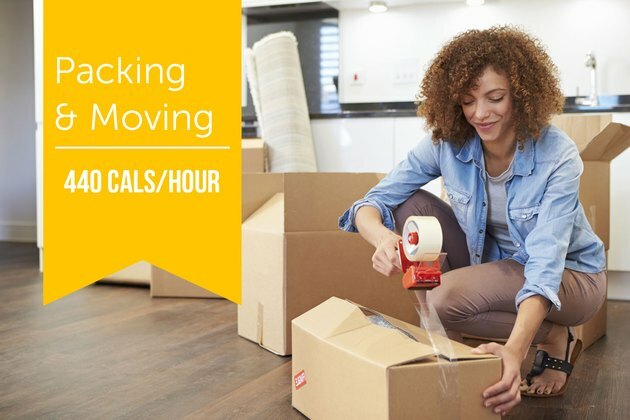 But if done with good form, moving can burn a hefty amount of calories. You'll burn 223 calories just by moving your furniture for 30 minutes. Carrying boxes and loading them into a truck will burn 260 calories in a half hour. You'll burn that same amount for every hour you unpack your things. If you're moving furniture, work with a partner and wear supportive shoes. Always squat down to lift with your legs instead of your back. And as your arms grow fatigued, watch your posture and avoid hunching your shoulders up into your neck. No matter how much you dislike moving, you can't argue with the great calorie burn! 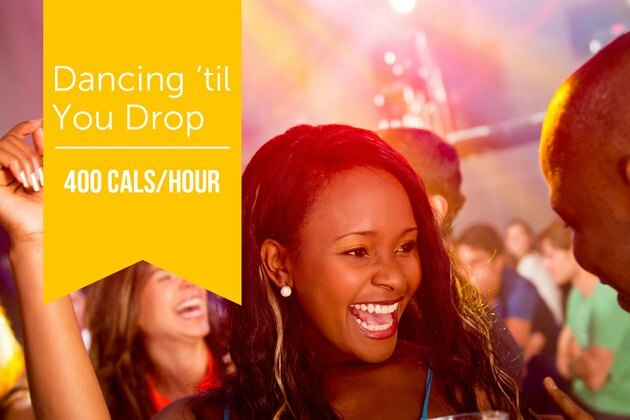 Put on your dancing shoes to burn 205 to 233 calories in just 30 minutes. You can't simply waltz around the house, though. You'll need to break out your best twist or jitterbug to burn this many calories — and it has to be nonstop for 30 minutes. While you're tapping your feet and doing the twist, be sure to keep your core engaged and use your inner-thigh muscles, quads and glutes to swivel those hips. You can also burn these calories while doing classical ballet, so if you've always wanted to pirouette around the office, now's your chance! Golf is a sport that involves walking and swinging (which works the oblique muscles, but it's not an everyday activity for everyone). However, in 30 minutes of your game, you'll burn 205 calories. You can't do it by riding in a cart, though. You'll have to walk the course, skip the caddy and actually carry your own clubs. 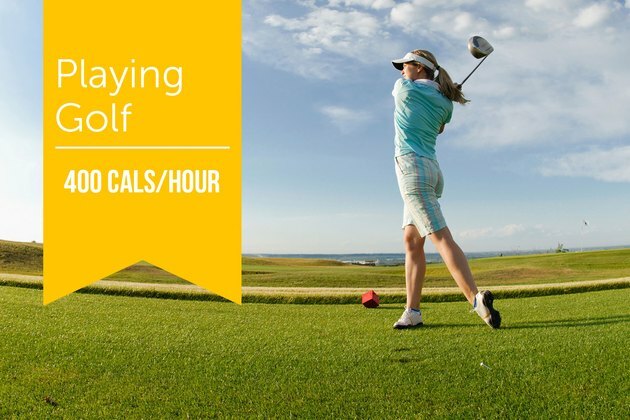 In order to optimize your golf game and get the most calorie-burning benefit, engage your core as you walk. Think about your posture, keeping your shoulders rolled back and down, alternating arms for your golf bag. When walking up or down hills, think about using your quads and glutes to help you maintain your strong posture. Then as you draw back to swing your club, inhale, engage your inner thighs and focus on your oblique muscles. As you initiate the swing, put your eye on the ball, exhale and swing. How Many Calories Does Walking & Pulling Golf Cart Burn? How Long Does It Take to Burn 300 Calories? 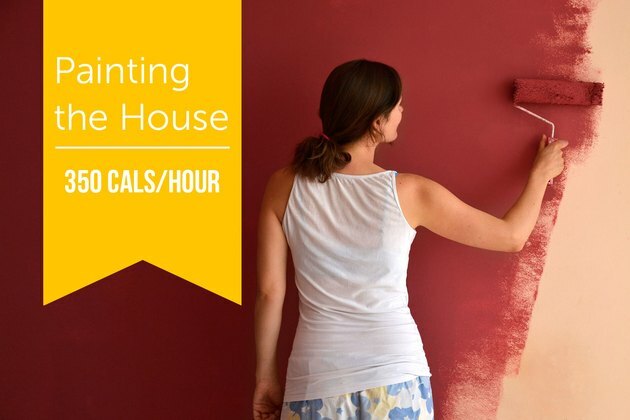 How Many Calories Are Burned by Painting the Walls?